Bonus: They’re still on sale. Whether you procrastinated your holiday gift shopping or forgot you have a Secret Santa gift exchange this week (it happens to the best of us), scavenging for last-minute gifts can be a highly stressful situation. Luckily for all the design-minded people on your list, CB2 is still offering guaranteed Christmas delivery, if you order by December 20. And in even better news, certain gifts are discounted up to 30 percent. Looking to check a few of those final presents off your list? Here, our favorite stylish finds from CB2 to add to your carts now. Your giftee will never be able to guess they were last-minute buys. Whether or not your giftee actually uses this pyramid incense burner to burn incense, it definitely makes for a striking sculptural accent piece. Inspired by ancient Egypt and designed in partnership with students at the School of the Art Institute of Chicago, this unique piece makes a great little gift for someone who appreciates the calming effects and spiritual aspect of incense. Champagne glasses and coupes are all well and good, but this stemless option is a modern take that also makes a perfect hostess gift. At under $4 apiece, you can buy a set and pair with a bottle of bubbly for a more thought-out bundle—just in time for New Year’s Eve festivities. While we love CB2 for its endless supply of trendy home goods, its other offerings are equally noteworthy. 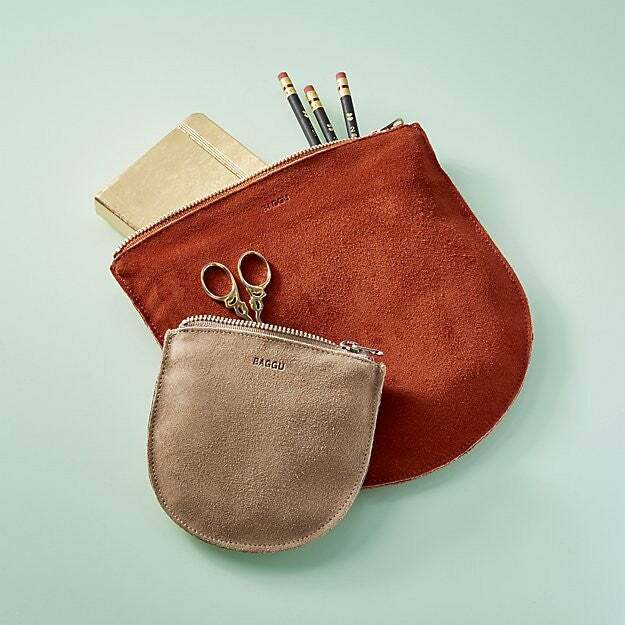 These suede pouches, made from soft naturally-milled leather and created by Baggu, are one such find. Ultra useful for everything from holding makeup to storing chargers, they fit into most purses and help keep everyday essentials easy to access on the go. For the tea aficionado, this kaleidoscope kettle definitely beats heating up water in the microwave. The almost futuristic design brings a modern update to afternoon tea and makes a beautiful kitchen decor piece on its own. Gift alonside a box of their favorite teas for a package as useful as it is stylish. For the frequent entertainer, these sleek mini glasses make a great bar cart addition. Perfectly minimalist in their design, they can even be used to serve cocktail snacks—and a multifunctional gift is always the best kind of gift. Include a bottle of your friend’s favorite alcohol to make this a more complete gift set. Have someone on your list who’s either hard to shop for or who you don’t know that well? When in doubt, flowers are the way to go—and if you gift them in a sophisticated terracotta vase, your gift recipient will appreciate them all the more. Help make morning coffee just a little bit more luxurious with a pretty grey stoneware set. Though a sugar and creamer duo may not be a kitchen necessity for anyone who is not the Queen of England, it’s an extra addition that helps build a kitchen collection and will definitely come in handy if they ever host a more formal at-home brunch. A step above a regular candle holder, this elegant glass cylinder will add a hint of luxury to any tabletop thanks to the white marble base. While a simple pillar candle is all that’s needed to make this accessory complete, it could also be used to display seasonal decor. For example, filling the hurricane with festive baubles during the holidays or using it to store pinecones for an autumnal feel. Winter is here, and it’s cold; give a gift they’ll be able to instantly use and appreciate. The soft blue hue of this throw is a bit more unusual than a standard neutral-colored one but still subdued enough that it won’t detract from their living room or bedroom decor. Are these or are these not the chicest pet toys you’ve ever seen? For the pet lover in your life who values the well-being of their furry friend over their own—there’s always the one—a gift like this is perfect. They’ll appreciate the extra thought that went into finding something tailored to their lifestyle over something more generic. Packaged in a clear apothecary jar with black rattan reeds, this minimalist spa-inspired diffuser looks as nice as it smells. Notes of amber, vanilla, and black fig provide a clean yet sweet scent anyone will love. Use to dress up desk decor or up the calming feel of a bathroom.